Victoria 6 has been released. BaruBary, I think for a while at least, male and unisex clothes will be made for Genesis only. Any official G2M shape is far ahead and even when it would be released (if at all), autofit will be able to pick up most Genesis-specific clothes for G2 because most of male clothes are closer to bodysuit than female ones anyway so vendors will catch both bases at once. I am pleased so far. I now await Michael 6! I guess, even for V6 one could use Autofit as an argument that both, Gen1 and Gen2 will continue to see some support. However, do we really want to start counting 'clothes that can be autofitted to Genesis 2' as actual Genesis 2 content? I mean I never heard anyone saying: See how much Renderosity supports Genesis - you can autofit all the V4 clothes released over there to Genesis. Also it seems to me that dressing a character that's specifically made to escape the downsides of unified male/female/gelgamek shape in clothing that's based on said unified shape...well it kinda defeats the purpose, doesn't it? Also,personally, I don't trust autofit that much. Granted, I haven't used it much, so my opinion is worth very little, here. However there have been some rather critical posts by cwichura on the topic and he happens to be someone whose opinion I hold in very high regard. Also, I've seen so many renders in the past which were supposed to prove how great this or that outfit had been autofitted to Genesis, which made me go "err....really? ", that I guess I'm just more inclined to listen to the negative voices. Why would a new user should pick Genesis 2 over Genesis? Or why me as a Genesis user would spend on Genesis 2 and the content needed to get (some of) the basic functionality of the original Genesis? I mean, I can see the big disadvantages of Genesis 2 compared to the original Genesis, but what does it offers to compensate for them? I’m still missing it and the thread got long. For me the value of Genesis 2 is that it allows for a more detailed and lifelike female figure. And that's something that's important for many users--for some, that's what is most important. As more Genesis 2 products come out, its value will only grow, just as happened for Genesis. I still prefer the flexibility and universality of the original Genesis though. I'll be using both figures...but more often Genesis 1 for the foreseeable future. Fortunately new users (and not so new users) have access to both, and can choose whichever figure is more fitting for their purposes. Then I must have missed something, because when I checked in yesterday (22.00 GMT) it wasn't for sale. Ah, whatever, I just bought her. There was an extra 10% on the Platinum Club discount for DAZ Originals yesterday - it's possible that it ran on into today. I have sent a query in to DAZ and if I get a definite answer I will let you know, but for now I think it probably was the end of the additional PC discount that you saw. I'm afraid the 51% discount is correct - those who bought at 58% off enjoyed an unintended bonus. Ah, that would explain why it was cheaper this morning, I possibly should have bought it then. Sigh. I don't ask for much, but when I want to buy something, I wish that the merchant would be consistently clear, and fair. It seems like DAZ has had an awful lot of store goofs and loopholes, etc., and frankly, it gets really discouraging. You see something, think about it for just a few hours, and decide to purchase it, bang, it's suddenly more expensive. Not a day later, not a week later, but a couple of hours, with no indicator that there was a time limit. I'm sorry, but that seems sloppy. Grumble, mumble. I suddenly feel a lot less like purchasing, not because of a 51% vs 58% price delta, but more the fact that I expect a bit of consistency. Hey, look at it this way: Compared to where we were this time last year, this is a picnic. For me Genisis's unimesh provided a easy way to do the mitple races in my game project. Once i get it to work with Java i can manipulate the mesh and morph it for 80% of the races withonly the esoteric ones like Centaurs needing a different mesh but if I go Gen 2 suddenly i need 2 different meshes for that 80% and half of them wont be viable anway. Can i make a dwarf? A gnome? No there is no child morph. What about a lizard creature? Gorilla? Nope, nope, nope. Maybe just like every other store it is being staffed by students that are working to pay their way through college and just for fun the switch the labels around to relieve boredom. I don't know, I used to be a DAZ booster, but lately, they are making it really hard. As for making "gender specific" clothes as a benefit... judging from V4 catalog on Renderosity in last two years it will be mostly skimwear. From experience of previous years I don't see how "gender-specific" outfits would benefit people who prefer to render non-females. Or, for that matter, non-adult females. I don't think anyone is supposed to pick Genesis 2 over Genesis. As I see it, Gen2 is just a new figure, just as Victoria 4 was, Michael 4 was, Genesis was. There is room for both Geneses in the runtime. Some good points and I don't regret my Genesis investment either. But as for you point above, I have to disagree. Sure, we have a choice RIGHT NOW... but next year? The history of Studio updates requiring new Genesis Updates show that unless DAZ is willing to divert their limited resources on "tweaking" an old model, at Some point, they will drop Genesis. They were ready to drop V4 support for Gen2 until a PA came to our rescue. This means your old Genesis will simply NOT LOAD in a future Studio. Of course, we can always choose not to upgrade Studio at that point. Who needs those nifty improvements in rendering or speed? It's a matter of time before we are forced to choose between the old Studio with Genesis or the latest Studio without it. And when that time comes, a PA will be unable to save the day. Murgatroyd, Or very adult females who can't walk around in leotards and chainmail bikinis. I really don't understand what all the arguments are about. I think the new Genesis 2 Female is fabulous!! I mean, just look at this great shape!! P.S. Just trying to lighten the mood so don't hate me. I was just looking through the various products I'm not going to buy, and I just have to say, string bikinis do not work like that. Seriously, take a look at the string running between the cups, and try to reconcile it with the laws of physics. It looks like Victoria 4 for Genesis 2 Female is pretty much a mandatory purchase if you want to use V4 skins. Yes, it's an mandatory, but that was included in gen5 and now it's optinal and we have to pay for it. You could also use Map Transfer in DS to bake V4 maps to V5 (assuming you have the V5 UVs for G1) and then apply those to G2. Note that the V4 add-on for G2F is a PA item, not a DAZ item, which means it can't be bundled as it stands. Now that sounds interesting, but where do I find the Map Transfer and any documentation about how to use it? I'm still using V3 and now and again V4. Another update that requires a money tree to keep up with. What do people do with all their rendered images of half naked females. We need to see more 'real characters' as well. there is a small tutorial about how to do some Map Transfers but I'm having problem with it. Yeah. I wonder if they used a rigidity map, if you could keep it from following the body so inaccurately? Anyone know if it use the original V4 UVs for Genesis when it transfers the textures from V4 to (for example) V5? I really hope it doesn't come to that. Also I really don't see any real reason to release Genesis 2 just yet when all it has is a few tweaks over Genesis. And worst to bust up the all-in-one Genesis (which I repeat is awesome) into separate gender models. Anyhoot if I want a realistic woman then I'll go out and meet a woman, can't get more real than that. BTW online dating is costing us millions http://www.smh.com.au/digital-life/digital-life-news/online-dating-dupes-people-out-of-millions-20130616-2ocae.html . Maybe they should also add to the article some peoples love affair with Victoria 1 through 6++. LOL. I wonder if we should ask government to pass a bill to allow us to legally marry virtual people? Divorce would definitely be much easier process. CTRL-ALT-DEL. I've yet to see any clothes that aren't dynamic get this right. I just tried the G1 Hongyu bikini on plain G2, and I see very little difference from the string bikini. It's just a limitation of the way conforming clothes have to work. Speaking of which, I just tried the Hongyu on G1 as well, side-by-side. Spin them round. See the W-shaped waistband distortion on G2? Just like it is on G1. Autofit might be better (by how much is debateable), but it's not there yet. I'm not in a hurry to get V6 either, although I might be persuadable for G2 goodies if anything really good comes out. One of the major things that attracted me to Genesis was the ability of the figure to change into men, women, children, teenagers, monsters, aliens and even a Gorilla. Genesis provided a LOT of options. One mesh, one figure, no need to buy new clothes for multiple figures anymore. YAY! Now that DAZ has released Genesis 2 along with Victoria 6, that's no longer the case. Now they will no longer have Genesis capable of changing into a man, woman, child, monster, alien, etc, in one mesh. Now, Genesis 2 will be two completely different meshes. One male, one female. Apparently, Genesis 1 can make men who are "good enough" but not "entirely" accurate. Really? REALLY?! You mean my Michael 5, David 5, Freak 5 DON'T look 100% completely MALE?! Bullcrap. They sure LOOK 100% male to me. So, why exactly is Genesis 2 now going to have a gender split? So the vendors can make more accurate clothes for both males and females. So THEY can have an easier time. While that's understandable, it's also completely unnecessary. In the past, females got more clothing than men. I'm sorry, but I don't want to go back to spending money on one clothing set for a guy and wishing I could put it on one of my female characters or vise versa or wishing there was a female version of it! That was the great thing about Genesis, I didn't have to worry about that anymore. I could now avoid many headaches. Not so anymore with "Genesis 2"
Generation X, by Dimension Theory, will eventually get an update because the Vendor said it himself on these forums. Old morphs from Generation 3, 4 and 5 will be able to transfer over to Genesis 2. I'm reasonably certain that male morphs will then be able to be injected into Genesis 2 "female" and Female morphs injected into Genesis 2 "male". All this for a "close & good enough" look? As much I love Dimension Theory and his revolutionary GenX plugin, it remains to be seen wheather this will change my mind about "Genesis 2". For now, the original Genesis is FAR more versatile, FAR more powerful and most definitely NOT worth the DOWNGRADE to Genesis 2. Sorry, DAZ, but your not getting a dime from me until you give me a VERY good reason to buy into the new "Genesis 2 Gender Split" you've got going on. Don't need the headaches I had in the past. I'd like to see whats so female about Mr.Hyde and whats so male about Mavka that they had to scratch the best feature. I'm puzzled. Found that if you use the DIM and have a content directory that has a custom name, it may install it as a 'content' folder within your content folder, in which case, cut it and put it in the correct area. The Teeth fit better in the mouth. There's MORE expressions, but Smile still looks wrong somehow. There needs to be more shaping morphs for 'squaring' the lips off for anger or pain, and to add more 'expression' to the mouth when it opens ('cause it opens lifelessly and very literally, look in a mirror at what YOUR face does when you open up). There's books on expressions! And pictures abound! Check out 'chin-balling' for an example. The back bends a bit nicer, but she still looks like she's suffering from severe back pain and can't curve it. The 'long-bum' syndrome still exists and Gen1 has morph packages to fix this. Not really seeing anything that makes it super special compared to V5 etc. Not overly impressed since Gen1 was only recently introduced. I suspect this will be the case actually, per my previous posts. I also pointed out why this isn't necessarily a bad thing in the same posts. I did search the forum for your posts, but I can't really find anything related to this. If you have the extra time, maybe you could explain to me how splitting a very small amount of content between two figures in going benefit either of them in the long run. I honestly don't get it. Yes, I can see where the misunderstanding is, and it is my fault. Your post mentioned "(little) support already...." which for some reason I overlooked. I don't see the split in support a bad thing because I see the two serving different markets and because I don't see the lack of support you do. That is probably partially due to the fact that what I pick up from the stores is supplemental. Also, I see the market as a dynamic area that is opening for growth and more PA's being able to come into the marketplace. In other words, where you see lack of support, I see potential for growth and opportunity. I'm not saying you are wrong, just that because we are coming at this from different perspectives, we see a different win/loss perspective. I will summarize what I was referring to about previous posts... I see Genesis 1 as fundamentally different then Gen6... as others have also mentioned since (my original posting.) I see Gen6 as the successors to the previous Gen1-4. I personally wish they hadn't referred to V6 as Genesis 2 as it is my perspective that Genesis is a fundamentally different vision and should continue to grow tangentially and separate from the more specific Gen(X) lines. It has to do with specialization vs generalization... there is room for both, as they serve different functions. If one sees a limited set of resources for generating content for the two, this could be an unhappy tradeoff. If one takes the approach of trying to equip their specialized characters with the whole gamut of more generalized clothing etc... again, it is an unhappy tradeoff. However, if DAZ did take the approach of keeping the Genesis line and the Gen(X) lines going but separate, people could choose either platform or both depending on their specific goals... at that point, it would just be a matter of whether new PA's in the market could keep up with providing content for both lines. [Edit] In the vision I have, I would like to see Genesis grow to be instance friendly, like 'Send in the Clones' on steroids, but resource friendly... something that could take advantage of it's flexibility to fill out crowd scenes with a semi automated method similar to VUE's ability to 'paint' trees, plants, etc... across a landscape, but with characters in an area such as the seating of a circus tent complete with varying shapes and clothing within predefined parameters. If anyone isn't familiar with what I'm referring to with VUE, I highly recommend looking at a couple/few videos of their Dynamic Ecosystem at either their site or YouTube. Then think of that, but with people/outfits/morphs... This vision is a ways off, but Genesis is on the right track for being able to eventually do something like that it would seem. This end goal is fundamentally different then trying to get the most realistic human possible, like the difference in the cherry blossom in a background tree is to a closeup of the cherry blossom. Putting the detail of a closeup blossom into a tree with thousands of blossoms, then replicating that tree would not only be unfeasible, but a waste of resources. I would like 'realistic' background characters, such as Genesis, but I would also like 'hyper-realistic' characters for closeup and main character functions. I don't need to look at the Genesis 2 Starter Essentials. I don't need to play with anything related to Genesis 2. DAZ lost my attention, interest, and buying power with this gender-split downgrade. Genesis sparked my attention. It sparked my creativity. 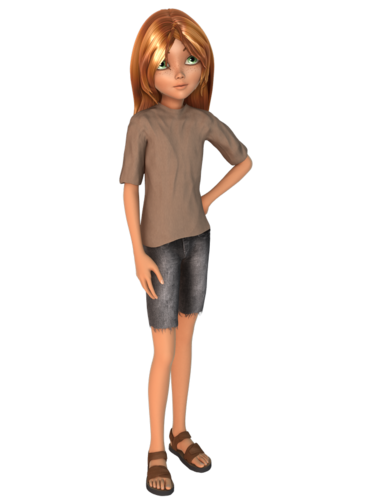 With the ability to create so many variant figures from ONE base mesh, DAZ gave me the power to create not only my main character, but his twin children, and have them carry a family resemblance, because the children were morphed down from the 'parent' character. And there ain't a soul who's seen them that has said that Torryn didn't look 'male' enough, or Tianna didn't look dang female. One figure in my Runtime, almost endless possibility. Ongoing support for Genesis has been lacking as it is. Main example being Auto-Fit, which still can't get simple footwear fit properly without crumpling it like newspaper. Are we seriously expected to believe that that's EVER going to get fixed with time and manpower now focused on Genesis 2, which I'd wager will take MORE of both, due to the gender-split? Rawnart - This man has taken Genesis to places I NEVER thought it could go. And has plans to go further still. Zev0 - Aging, bending, movement...ALL equal or better than anything I've seen so far from DAZ. Thorn & Handspan Studios - Morph Resources Kits...Oh. My. Gods. Those are just a few examples of brilliant PA's doing DAZ's work for them. Maybe that's by design...nothing wrong with it, I suppose. But the point is, we don't NEED Genesis 2. Genesis is evolving just fine, at least from my standpoint. I certainly don't have any need whatsoever for Victoria 6, especially when I'd be LOSING compatibility, or spending MORE of my (or my company's) money to achieve functionality I already have. Now I'll admit, I'm nowhere near the level of artist of some of the people in this community. That's why I mainly lurk the forums and read, and learn, and practice techniques from those more skilled than I. And as I'm not a content creator, I have no idea if it will be 'easier' for PA's to create clothing with the gender-split Genesis 2. However, I AM a professional artist, in a buying position for a small company. And as such, I have to weigh all the variables before deciding if a particular product is worth the investment. Not only does Genesis 2 not meet those criteria, it smacks of being a corporate decision to nickel & dime more money from customers who may be wringing out their wallets as it is. One of the things I liked about DAZ was they seemed to be PART of the community, rather than hovering ABOVE it. Recent trends are changing that perception, at least as far as I'm concerned. Can't say I'm liking that change in perception. Thanks for reading this far. Don't forget SickleYield's templates for autofit, which make most shoes somewhat passable and long skirts pretty darn good and chest less clingy! And Dimension's GenX to let us us old morphs on Genesis! This is pure, unnecessary hyperbole. I believe you can still load V1 in DAZ Studio. You are confusing character compatibility with application compatibility. MallenLane added character compatibility for V4 to Genesis 2, but nothing...nothing AT ALL in DAZ's behavior has now or ever suggested that application compatibility with Genesis would ever be lost. Your investment in Genesis 1 items is just fine, and you will not lose your ability to morph ALL the things. There are folks who adore A3, and they still use it, and all its stuff. Which is still sold here, I'll note. But at the same time progress moves on, and while you can continue to use any older figure that captured your fancy in the latest and greatest version, that doesn't mean DAZ should stop there also. There are plenty of issues, and I admit the one that concerns me most is the potential for gender Balkanization of clothing. We will have to see how things work out with Gen2M. So far I'm having near-perfect adaptation of Genesis clothes to Genesis 2 though (and SHOCKINGLY Good adaptation of V4 clothes thanks to MallenLane), so I feel at the least that the significant back-catalog of clothing currently available for guys will continue to be available, and more will come out, albeit not at the same pace as it did for Genesis. Take a step back, render something with your favorite character, and revel in the fact that if A3 is anything to go by, you'll still be using Genesis in 2020 if you want to be.